Charles Bronson is one of my favorite on screen personalities but honestly, I don't think he starred in that many great films. Sure his ensemble work in The Magnificent Seven, Battle of the Bulge, The Great Escape, The Dirty Dozen and Once Upon a Time in the West make each of those films more interesting but in terms of leading man vehicles, I'm hard pressed to rewatch many as they became "Charles Bronson" movies instead of just, movies. 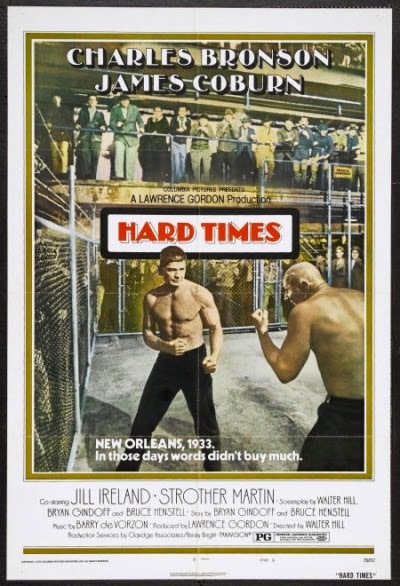 One of my favorites, probably my all time favorite Bronson flick is 1975's Hard Times. It's just one of those movies I can pop in anytime and still get caught up in. A few years ago I even got to see it on the big screen with some of the surviving cast attending at The New Beverly. Hard Times is the story of a mysterious drifter and street fighter named Chaney (Bronson). We don't know where he came from and never learn anything about his past. Rolling into the Depression era streets of Louisiana, Chaney teams up with big boasting hustler and fight organizer Speed (Mag 7 & Great Escape co-star James Coburn) as they set out to make some money. Chaney's scrapping skills attract the attention of the local shady businessmen and he's forced into a final fight with their hired hitter all the way from Chicago. Bare knuckle brawling, oyster eating, high stakes gambling, yoked 52 year old Bronson, fox grinning James Coburn, southern man Strother Martin, fish smelling awesomeness ensues. Chaney picks up a lady friend, Lucy, played by real life spouse Jill Ireland in arguably her greatest performance opposite her husband. Way better than last Bronson of the Day title Cold Sweat where she overacted being high and screamed a lot. She peppers him with questions that he somehow never really answers. Chaney's not looking to bother anyone and doesn't look past the next bend in the road. Walter Hill directs a revised script from Bryan Gindoff and Bruce Henstell. Hill is one of my favorite writer/directors with flicks like The Warriors and Streets of Fire also being examples of exciting, weird flicks set in their own worlds like Hard Times. The flick is sparse, you could say not a ton happens but it's still somehow extremely engrossing. The script was the same way, there's a great description of a bar being thick with smoke and losers. Using the country vistas and industrial landscape of New Orleans (factories, warehouses, docks), Hill creates a downtrodden world without making it mean or empty as he would later do with movies like Johnny Handsome or most recent Bullet to the Head. 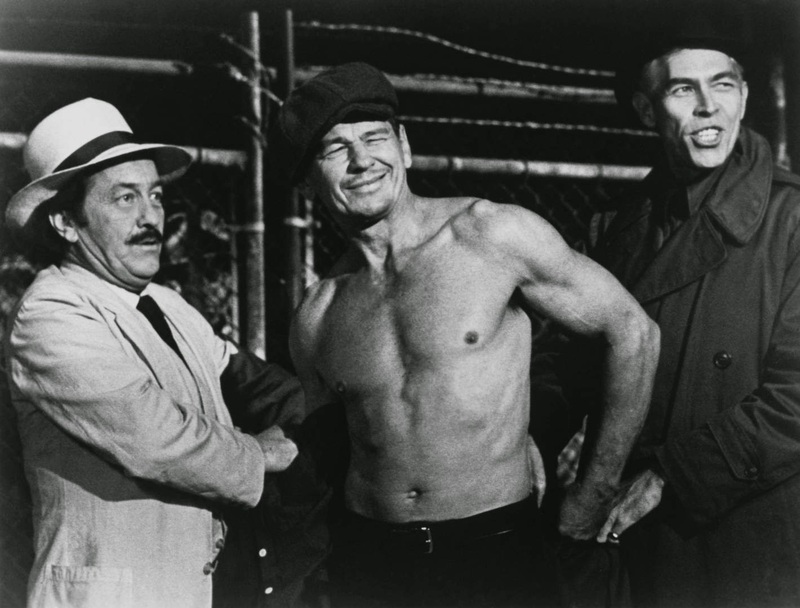 A mustache-less Charles Bronson is terrific as Chaney in a performance that blends world weariness and tired eyes mixed with rough and tumble fight scenes where he shows off his muscular, vascular and trim physique in effective cinematic bouts of fisticuffs that are raw, awkward and exciting versus cleanly or overly choreographed. James Coburn gets to do a lot of the talking as fast and big mouthed Speed with his great big grin, never losing his confidence as the perennial loser. Strother Martin is great as the strange yet endearing opium addict cut man Poe who still dresses in fine duds and recites poetry. Barry De Vorzon provides a Cajun-folk infused score that fits the films easy going pace and would later give Hill's The Warriors a memorable, forward charging synth soundtrack. Reportedly costing $2.7 million clams, Hard Times would be one of Bronson's first American star vehicles post 1974's mega hit, Death Wish, which was a top earner of the year bringing in $22 million. Hard Times would turn a profit collecting $5 million with Walter Hill receiving participation checks to this day. Hill and Bronson never worked together again after the actor didn't appreciate the cutting of several of Ireland's scenes. Hill would remark that Bronson ran very hot and cold in the years after, on some occasions being warm and friendly and others not even acknowledging Hill's presence. James Coburn was said to have been difficult to work with on the set, maybe feeling disgruntled after co-starring with Bronson on earlier fare, coming into his own as a leading man in films like Our Man Flint, Duck, You Sucker and The President's Analyst but was now second banana to the international action star. Hill would go on to become a force in the industry during the 80's and 90's, producing the Alien series and directing genre and box office hits like The Warriors and 48 Hours. Bronson would change genres and eras for follow up western-mystery Breakheart Pass, based on an Alistair MacLean novel while Coburn went on to star in a crazy sounding action flick about rescuing a kidnapped family from a mountain top terrorist lair using hang gliders in Sky Riders. I need to find me a copy of that! Gotta Drank! Percy's and Co.